We are quality concern company widely mentioned among the leaders in the segment of packing machinery. 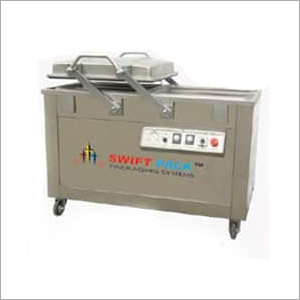 Over the years, we are recognized as Double Chamber Vacuum Packing Machine Supplier from Delhi, India. The machine is integrated with stupendous features such as stainless steel vacuum case, two sealing positions of vacuum chamber, and 1KPa lowest pressure of the vacuum chamber. We offer Vacuum Packing Machine Double Chamber, which had SS construction and is suitable for sealing vacuum pouches used in the industries like food, pharmaceutical, electronic etc. The machinery is very useful in safeguarding the products from the hazards of oxidation, corrosion and spoilage, hence elevating its storage period. This unit does not needs an external compressor for its smooth operation. It is integrated with digital control panel, from where the sealing time, temperature and cooling time can be controlled.